This entry was tagged comics, music, pajamas, reading, superhero, Superman. Bookmark the permalink. Oh wow! heart melting right here at my desk! what a go getter. So cute. Love the short hair. Man, they are growing up! I think it would only be fair to introduce Henry to Marvel comics as well. He’s a big Spiderman fan too. Sings the theme song all the time. I miss watching him grow up in person! What a fun and adorable & energetic Superman! Wish I could just grab him for a big smooch (although Superboy would just wriggle away!) Love the short haircut, although it might be colder for him outside. 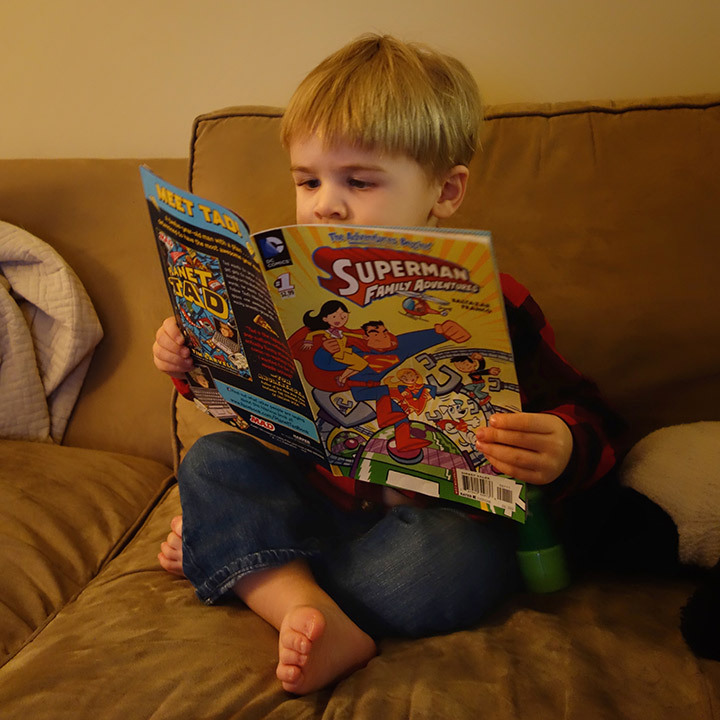 Takes after me (Gran Lois) and his daddy for his love of comic books. I was allowed to get one 10 cent comic book each Friday when my dad got paid, as long as I’d read it to my little sister. And Mark, I know you remember the rare comic book store on Magazine Street in N.O. Just have to mention Henry’s cute little toes. I recall a poem that said angels would be tempted to kiss a baby’s feet. I’m no angel, but I agree!